The Red Shirt protest appeared to be losing support and momentum- after achieving headlines, both positive and negative, for throwing blood around and the large crowds at the start of the protest, things have been quiet. In fact, the red shirt protest was struggling to make the top story in the local papers. The government and red shirts held talks, after two days they were abandoned with the red shirts saying the protests will continue and escalate. The protest still had a number of supports- 20,000- in Bangkok, but had become routine. 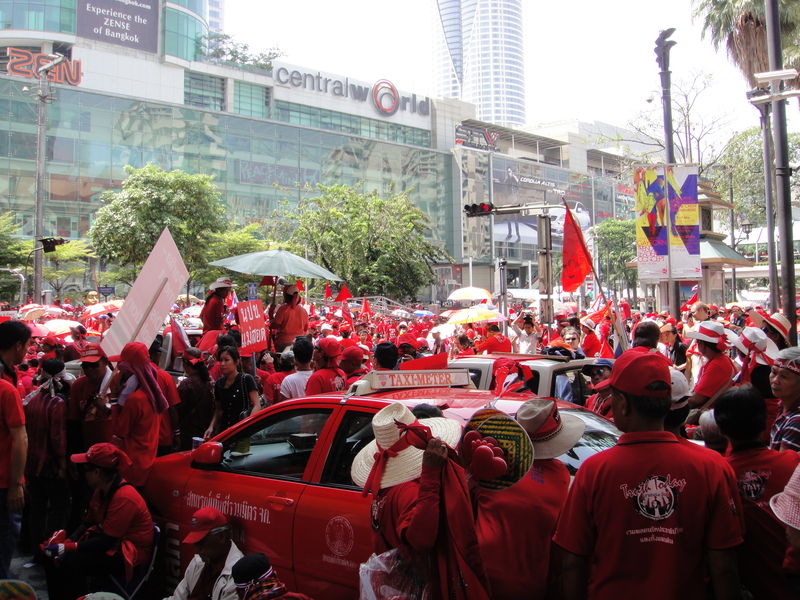 The red shirts appeared to be losing Bangkok’s support of their protest. 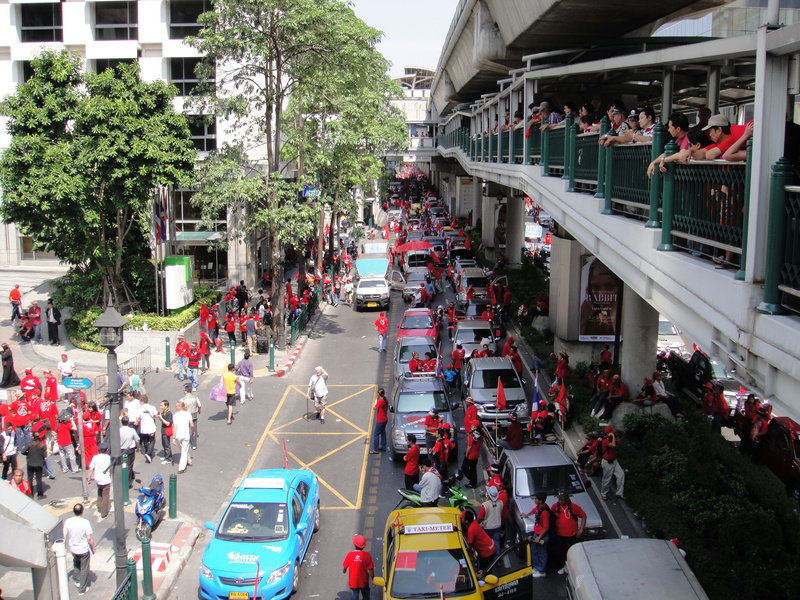 On 2 April business leaders held protests to protest the red shirts protest and the negative impact it is having on the image of Thailand and tourism. Local businesses and residents joined the protest saying the large gathering of red shirts in areas of the city impacts their daily trade and business. 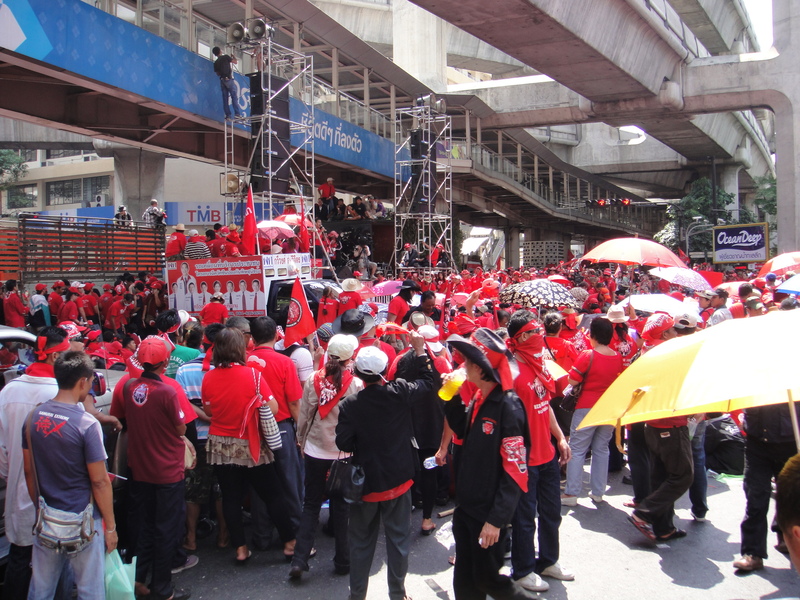 During the past week the red shirts promised a big protest for April 3, with large numbers of supporters turning out. They refused to give the exact location for the protest- a change from the past weeks. The time had come for the red shirts to cause a stir and gain some momentum. And they did that today. And they played a good hand. They took over the central shopping and business district, closing the major roads and massive shopping complexes. They are saying they won’t leave and will stay the night. From the looks of things, they are telling the truth- they have blocked at least 3 kilometers of Sukhumvit road and erected a major stage in the major intersection in front of Centralworld mall. The support is very good, vocal and large, possibly in excess of 60,000 people. Hitting at the center of commerce hurts the government. Siam Paragon & Centralworld malls are frequented by tourists and locals, they hold high-end international brand stores, major food courts, movie theatres and loads of restaurants and are a major destination to avoid the heat of the day- more like lifestyle and entertainment complexes than just malls. Sukhumvit, Witthayu and Ratchadamri are blocked; this is significant as these roads are major thoroughfares. If the red shirts stay in their current location, the protest has now moved from the “government” section of Bangkok directly into the heart of commerce and onto some of the busiest street in town. Well done, the red shirts cannot be ignored by the government and can now sit and wait on the government response. 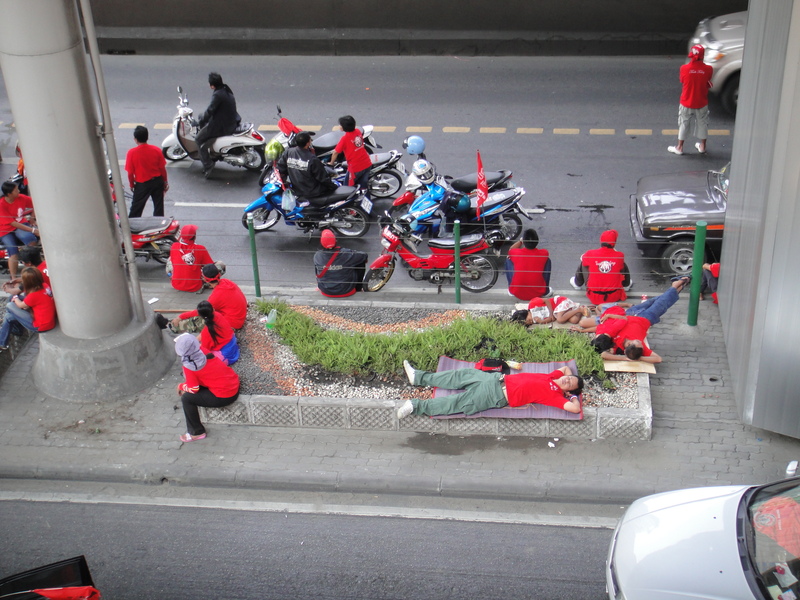 This entry was posted in Bangkok, Politics, Thailand and tagged red shirt protest april 3, Red Shirts in Bangkok. Bookmark the permalink. i am here in Bkk. been hanging with the redshirts for several days. they seem to be very good,inteligent,peaceful people. its actually very impressive how they mantain peace and order among themselves in such a large crowd. i dont know everything about whats going on,but from what i understand the redshirts agreed to a fair vote and said if they lost they would shut up and go,but they couldnt get a fair vote, apparently because(as i was told by a redshirt opposer)everybody knows the redshirts would win. is that democracy? hmmm. me and most of my friends in USA hate Obama and truly did not want him to be president, but he won the vote, so he ‘s in. thats only fair.